Monday was the first day of spring. And Brisbane sure did turn it on. Clear blue skies, easy golden sunshine, bare feet and the smell of jasmine wafting through from the backyard. It’s a funny thing but at the end of summer, when the autumn leaves start falling, I love the coziness of thick socks and red wine. But at the end of winter there is nothing better than warm evenings and going to bed in nothing but underwear! About a month ago S made a jar of preserved lemons (he puts cloves and cinnamon in with the lemons) and last week they were finally ready. I was pretty excited to start using them and wanted to make a dish in which they could star. Preserved lemons are traditionally used in Moroccan food but in any dish they make everything delicious. I deliberately kept the dressing really simple in this salad to let the preserved lemon shine, and it does its job wonderfully. Even W loved it – we found her in the open fridge picking bits of preserved lemon out of the leftover salad! 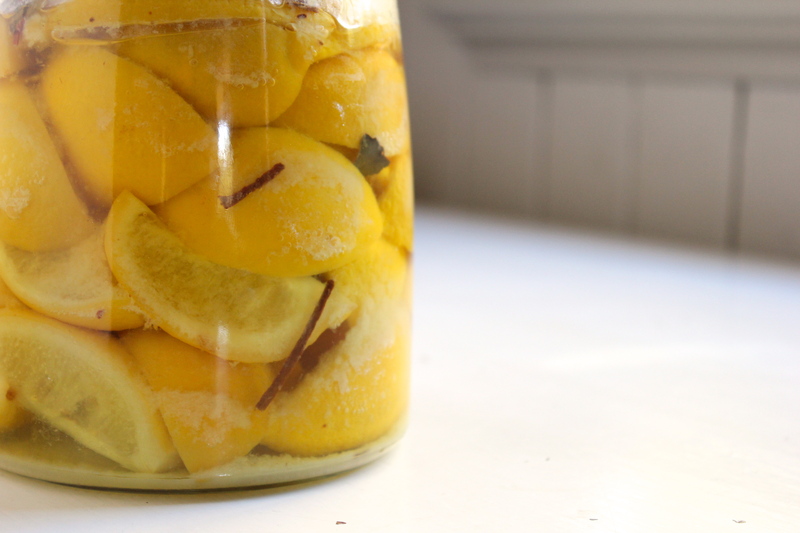 You can buy preserved lemons at most specialty food stories, but they really are pretty easy to make yourself. There are a few recipes online that you can try out – all you need is a clean jar, a big bag full of lemons, and a few other things. Although it will take a good month before the lemons are ready so if you get making some now, you’ll be able to enjoy this delicious salad in just a few short weeks. 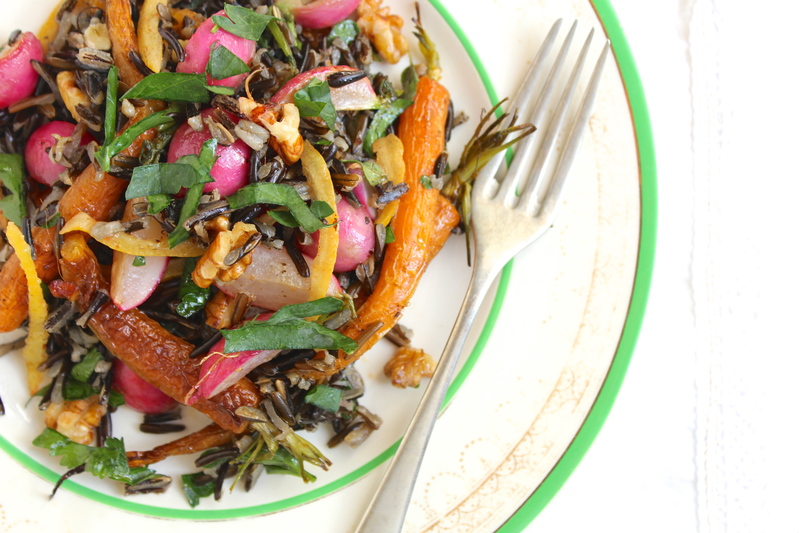 This Radish & Preserved Lemon Wild Rice Salad is a perfect spring dish. It’s relatively simple and, despite the steps involved, really easy to make. 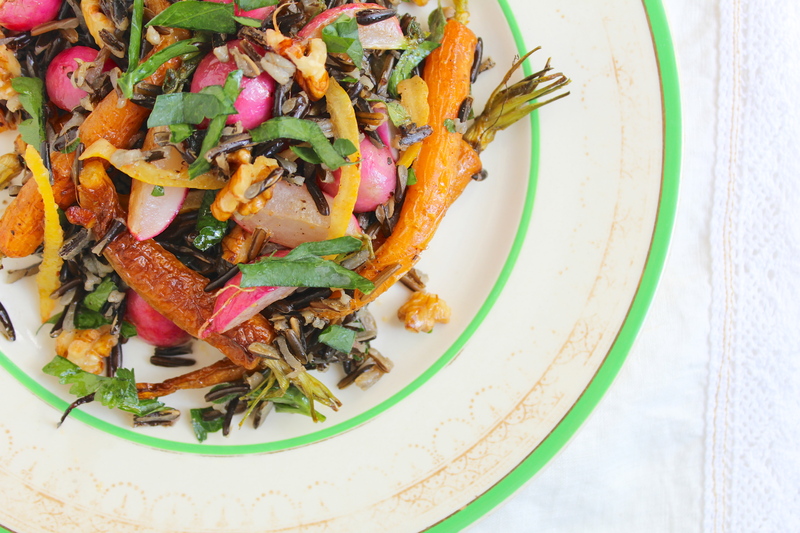 I know it’s expensive, but wild rice is deliciously nutty and much lighter than regular white or brown rice – indeed, it’s actually a grass rather than part of the rice family. Pan roasting the radishes deepen their flavour as well as taking the peppery edge off, and everyone knows that roasted carrots are one of the best things ever. 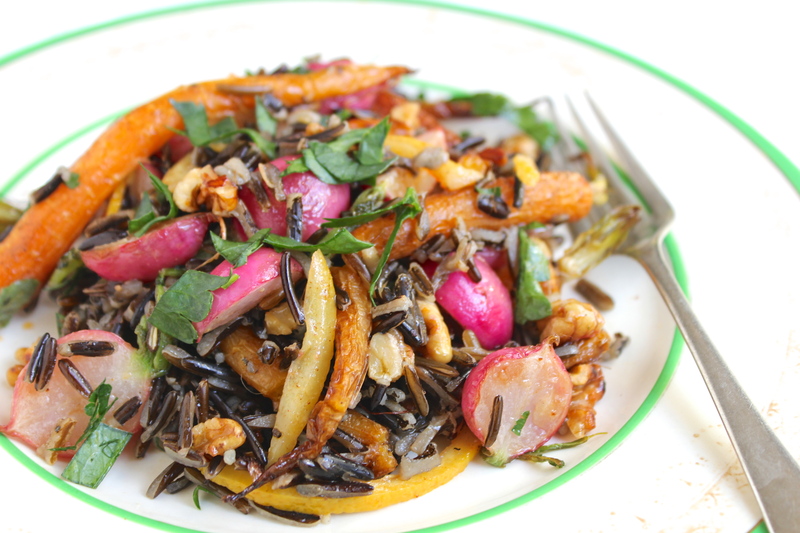 I also love how bright this salad is – pinks, oranges, yellows and greens. Anything that tastes this great and looks so good is worth the while. 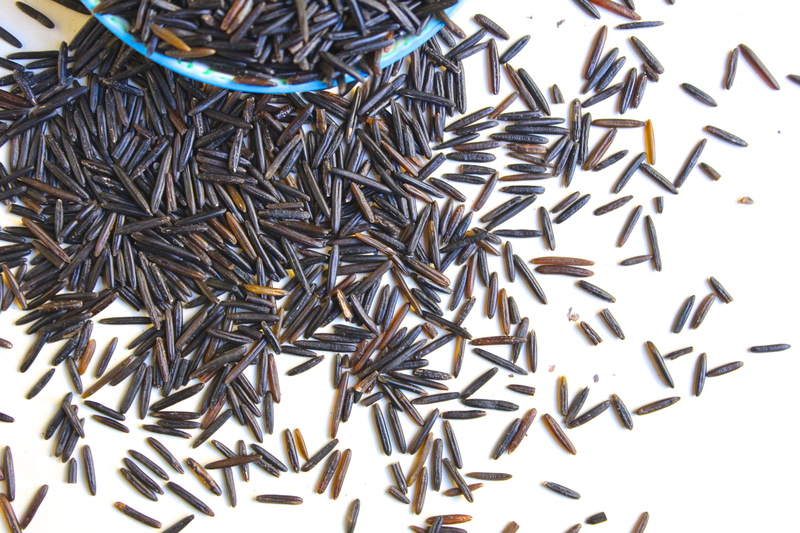 To cook your wild rice, boil 1½ cups of water in a pot, add a pinch of salt and the wild rice. Cover, reduce to a simmer, and cook until the rice is tender but not mushy, and the kernels have popped open, about 40 minutes. Fluff with a fork. Heat oven to 200°c/400°f. 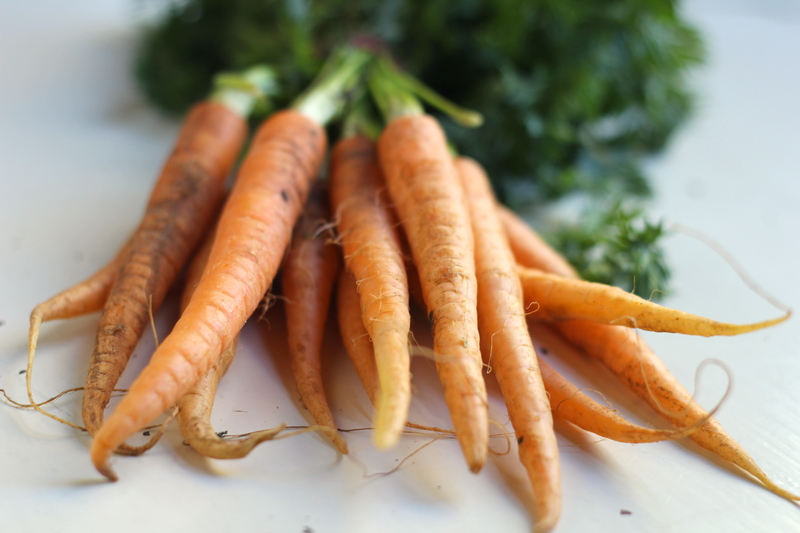 Wash the baby carrots and toss them through with the paprika and a generous glug of olive oil. Roast in the oven for approx. 20 mins, until tender. 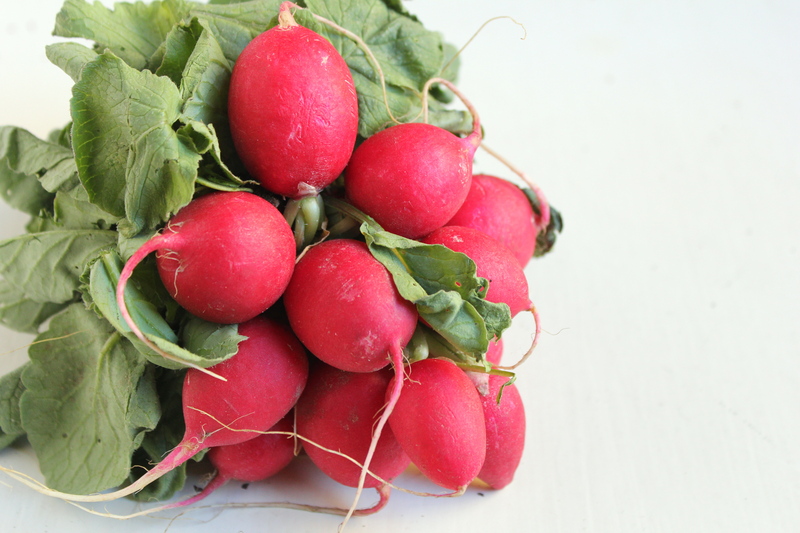 Trim the tops of the radishes and cut in half lengthways (in quarters if the radishes are very large). 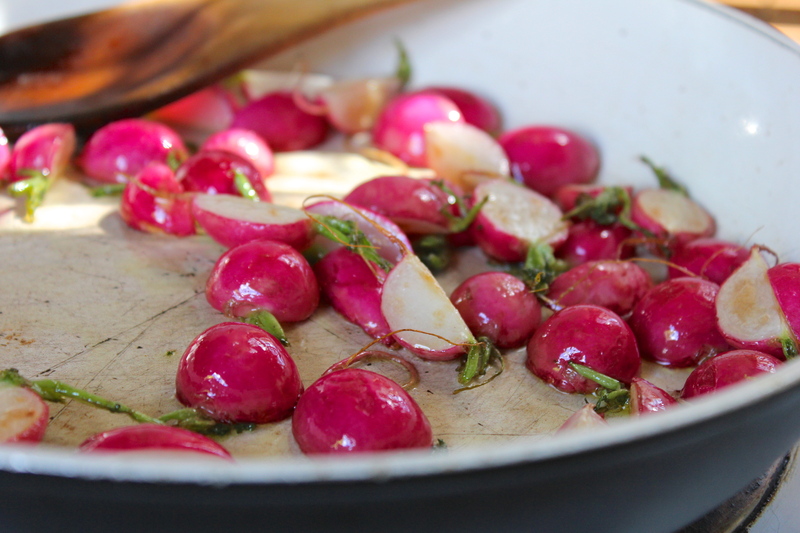 Heat a tablespoon of olive oil in a pan over medium-high heat and lay the radishes in a single layer, cut side down. Cook for approx. 10 mins, until the cut sides start to brown, then toss the pan and cook for a further 5 mins. Set aside. 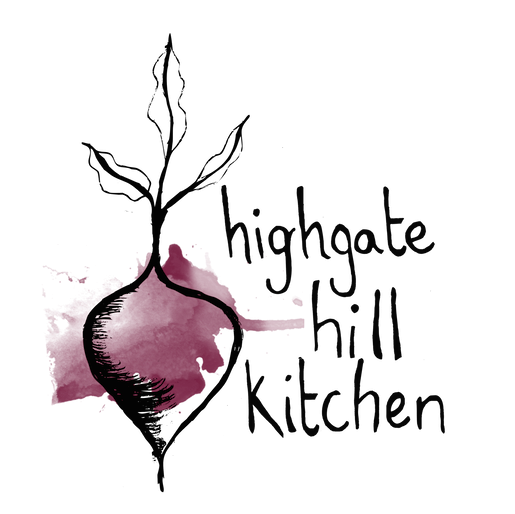 Roughly chop the walnuts and, using the same pan as the radishes, toast them over a medium-high heat for approx. 5 – 8 mins, tossing continually until they start to smell toasty. Remove the pulp from the preserved lemon and slice the rind into very thin strips. Roughly chop the oregano and parsley. 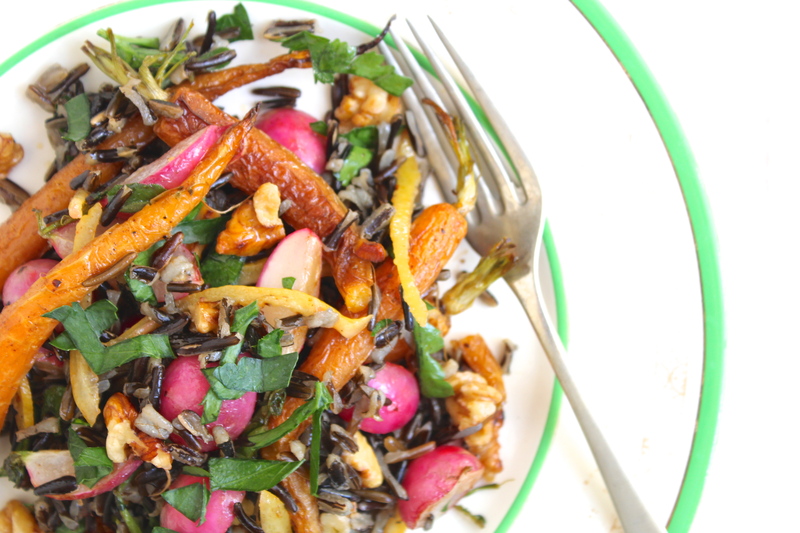 In a large bowl combine the wild rice, carrots, radishes, walnuts, lemon rind and the herbs. Pour over a glug of olive oil, half the orange juice and salt & pepper to taste. Have a taste and if it feels a little dry add the rest of the orange juice and/or some more olive oil. Delicious warm, or cold the next day! I happen to love Moroccan food and have a very similar sounding jar of preserved lemons in the fridge. 🙂 Hadn’t thought to pair it with wild rice but this sounds so good. Preserved lemons go well with pretty much anything, I’ve recently discovered!